Burn calories, lose weight, and build muscle right in the comforts of home with the Multi-Position Exercise Utility Bench from Marcy Pro! Engage in fat-burning training and develop a bulkier physique by investing in this high-performing equipment that’s designed for more efficient bodybuilding! Perfect for both amateur training and long-time fitness enthusiasts, this ergonomic exercise equipment allows a full-body workout, letting you build and tone your body the way you want. Made from sturdy powdered-coated steel and reinforced with high-density upholstery, this gear effectively resists scratches and chipping that may result from heavy use. This versatile equipment lets you do a variety of exercises to target specific muscle groups within a compact space. You can lift dumbbells and barbells while lying flat or do crunches and curls. It is also useful for switching between different exercises, including equipment-free ones. It can be used to train different parts of your physique, including the chest, shoulders, core are, and legs, ensuring balanced muscle development. With its compact structure, you can conveniently place this gear in your home gym without taking up too much space. This bench can support a maximum weight of 350 pounds. Reap the benefits of an intense workout with a high-end fitness equipment without leaving home with the Marcy Exercise Utility Bench and rack up a fitter body in record time! HEAVY-DUTY CONSTRUCTION - Made of a durable steel frame that's reinforced with powder coating, it's stabilized design, contoured foam roller pads, and high-density foam upholstery provides support and comfort to help get the most out of your workouts! 4-POSITION SEAT AND BACK PAD - Designed with a Multi-position bench and back pad, customize your training by laying this bench in an inclined, declined, or flat position. The backrest acts as cushioned support during training to help minimize fatigue. COMFORTABLE THIGH AND ANKLE ROLLER PADS - This fitness workout bench has soft foam roller pads to provide comfort. It has high-density upholstery for an enjoyable strength-training experience, letting you push yourself safely and comfortably. COMPACT FOLDABLE DESIGN - This deluxe bench has an ergonomic structure that is compact yet multifunctional. It is designed to fit inside your home without taking up too much space. The collapsible bench can be folded and stored in any corner! 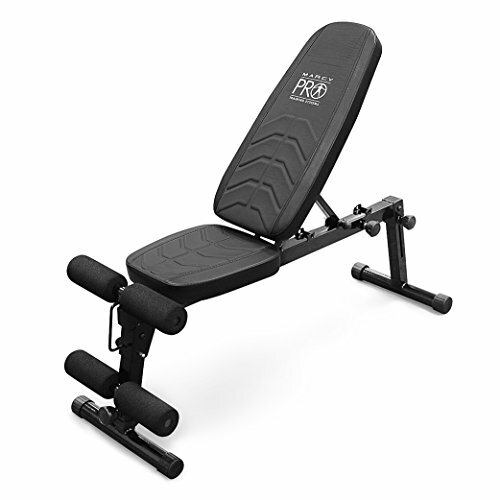 FULLBODY WORKOUT STATION - Target multiple muscle groups with this adjustable bench during exercises. It lets you perform various strength-training exercises for a full body workout. Pair it with a rack or cage, or use it with barbells and dumbbells.